Stainless steel washers serve a variety of critical functions. When it comes to distributing load or functioning as spacers, stainless steel washers are the ideal solution that will withstand the elements better than many other materials. Combined with the stainless steel stamping expertise of Peter Forg, you can be sure that you get the stainless steel washers you need when you need them, in a variety of sizes and configurations. We've been in business long enough to know that the requirements for stainless steel washers can vary considerably. With that in mind, we're ready to provide custom stainless steel stamping for washers from ¼" to 28" in diameter and everywhere in between. Add to that the ability to provide custom deep drawn stainless steel stamping, and we can fulfill virtually every request for stainless steel washers. At Peter Forg no job is too large or small! For more information on how to get started on your custom metal stamping project, contact us today! 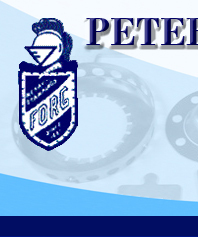 At Peter Forg Manufacturing, it's our goal to give you exactly what you need. 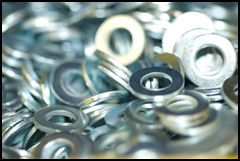 To that end, we work with every variety of stainless steel to deliver stainless steel washers with the material composition needed for a variety of applications and environments. We frequently provide. Widely used in equipment that requires high levels of durability such as machinery and automobiles, T304 stainless steel washers have greater resistance to oxidation and rust. While less frequently used, T316 stainless steel washers provide an even higher level of corrosion resistance, especially when it comes to pitting and crevice corrosion in chloride (salt) environments. T304l stainless steel washers are the low carbon alternative to T304 stainless steel. 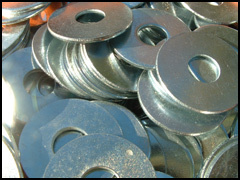 Low carbon stainless steel washers help provide even greater resistance to wear and corrosion. 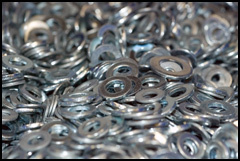 The low carbon version of our T316 stainless steel washers, T316L stainless steel washers are used when an even greater level of corrosion resistance is required. At Peter Forg, no job is too large or too small. When it comes to stainless steel washers, we want to provide what's need, when it's needed - no matter the requirement. From small to large and from few to many - you get the stainless steel washers you require. It's our goal to offer full-service washer manufacturing so that when you need stainless steel washers, there's no question where to turn for quality, reliability, and a fast turn-around. As part of our full service approach to stainless steel washer manufacturing, we offer value added services such as. For more information on stainless steel stamping at Peter Forg Manufacturing or for a free quote, contact us today.